There were portions of the show where she sat on the ground and I couldn’t see her. 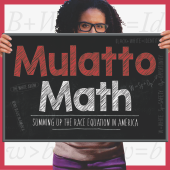 Mulatto Math is an incredible show that breaks down the race equation in America with power and grace. Monique is a genius at what she does!